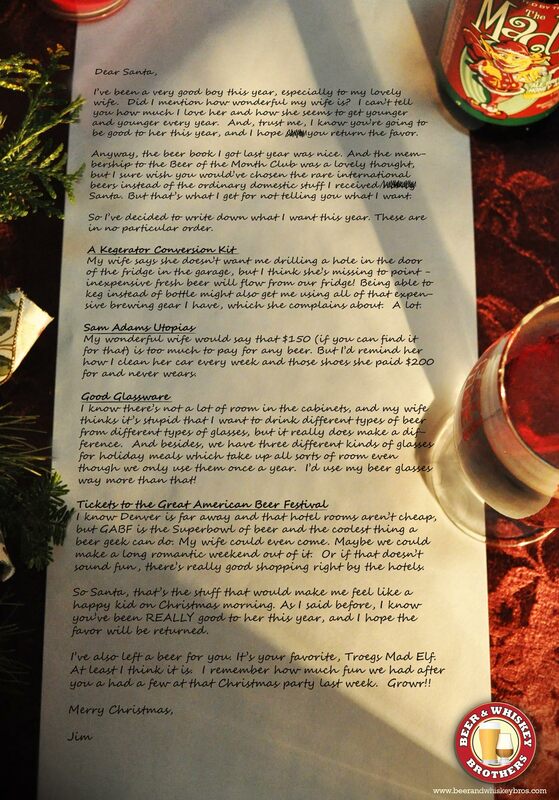 Good job, Jim, but I’m thinking if Santa finishes off that Mad Elf, he won’t make it to my house. Maybe that’s part of the plan? Exactly – more fun for me! Finally got to try Troegs Mad Elf on Friday, now I understand your fascination with it! A great Christmas beer that is deceptively strong — sigh, if I could only get more of it, if I had any more of it I’d be enjoying one on Christmas Eve. I had the glass from the pic above as we trimmed the tree last night. It’s a great companion for the holidays. 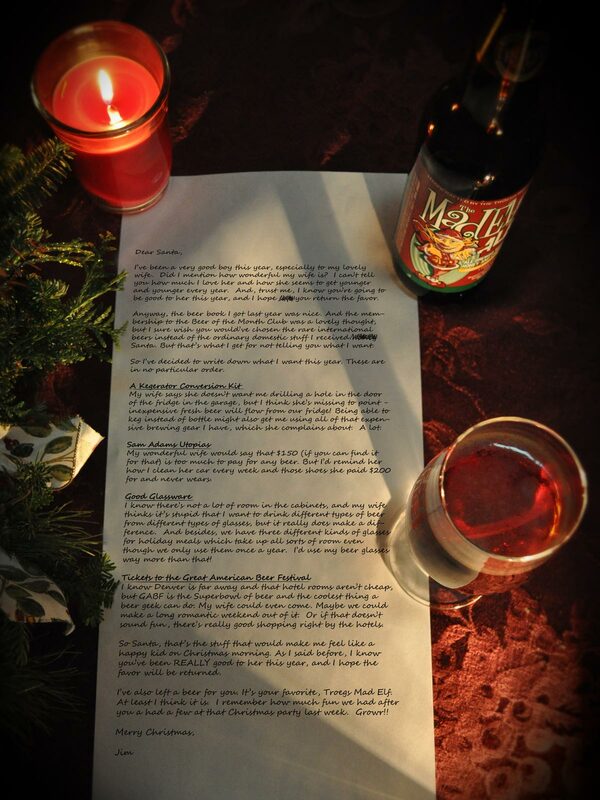 We leave a Mad Elf for Santa instead of milk too. Two Mad Elves might put Santa over the limit. You gotta be careful – don’t want the kids to find him sleeping in the tree! Very charming. It’s also disturbing if you keep the context that you’re actually writing to Santa. Especially the growl at the end! What can I say…Jim REALLY loves Santa! The man really knows his way around a coat check, I’ll tell you that much! Yeah, I kind of let it slip who “Santa” really is at the end. What’s the average attendance at GABF? 49,000. It is limited by the number of tickets they are allowed to sell at each session, however there are all sorts of local events that go on during that week, and it might be ok just to go without tickets, as most of the fun happens outside the venue. That looks suspiciously like my letter to Santa. I’m going to try volunteering at GABF this year; tickets are just too damn expensive. Yes, us beer geeks tend to think alike. I like the volunteering idea. Or even skipping the hall altogether and just going to the other side events. They were the best part of our trip.